We discussed how and why we got into living full-time in a recreational vehicle (RV) in our post titled, The Hard Start. This article is about the hardware, the RV itself; the equipment needed to live in it, and how we figured out what to buy and why. This article is about The Beast and The Fox. First, we had to decide how we wanted to live and travel in a RV. That part was easy for us. We wanted a comfortable home, but also a rig capable of accessing remote areas. We wanted to camp far out in the canyons, deserts, mountains, and forests of western North America from Canada, the U.S. and Mexico for weeks at a time, returning to “civilization” when we needed to re-stock supplies, do laundry, and visit a city or two along the way. We would follow good weather from north to south and north again – we just don’t like being cold anymore. Still, we knew there would be freezing nights and hot days too, so we would need to be prepared for that. Second, we needed to decide what type of RV would fit that lifestyle. We needed a vehicle large enough to live in full-time, yet small enough to maneuver around in tight spots, and tough enough to handle rough backroads. Our research also revealed that many state and national parks, many campgrounds, and some highways have length limits on RVs, so keeping the RV length below thirty feet long was a factor to consider. Overall, the RV needed to be self-contained with fresh water and waste tanks, plenty of battery power, have a comfortable bed and bathroom, and large cargo space which would allow us to carry all the equipment needed plus a few toys (mountain bikes, sea kayaks and backpacking gear). We needed a rig that would allow us to stay “out there” for weeks at a time. Finally, the cost. These things are expensive not to mention all the equipment needed to live in it. The cost of a new RV limited our choices and though used RVs are available everywhere, you never really know the history of them. And, unlike a simple motor vehicle, RVs have water and waste tanks, propane gas systems, air conditioners, furnaces and battery power systems all of which need to be in good working order. We could buy an inexpensive new RV, but we wanted a quality built rig and they cost more, so our search focused on high quality used ones. The variety of RVs is almost overwhelming. There are motorhomes in three classes (A, B & C) ranging from humongous busses to tiny conversion vans. There are compact campers that slip into the bed of a pickup truck, trailers (both travel trailers and fifth wheels) ranging from tiny trailers towable behind a car to gigantic fifth wheels that need a powerful truck to pull it. To top it off, all of these RVs can have “slide-outs” which are sections of the RV that can extend out from the sides to gain more floorspace inside. All have their advantages and disadvantages and the quality of them varies from cheap models built of plastic and vinyl to luxurious homes-on-wheels finished in leather, marble and hardwood. But, by focusing on our lifestyle, choosing the right type of RV wasn’t that difficult. We rejected the motorhome idea immediately. Too big, too expensive and you need to tow another vehicle behind them in order to travel around locally. Campers that fit into the bed of a pickup truck were too small, top-heavy and you have to haul the whole RV with you everywhere you go. We decided on a trailer that we could tow behind a pickup truck; either a travel trailer or a fifth wheel (travel trailers attach to a hitch under the rear bumper of the tow vehicle while fifth wheels attach to a special hitch mounted in the bed of a pickup truck). Trailers come in a huge variety of sizes and quality and we could disconnect from it and drive around independently in the tow vehicle allowing us much more mobility. Now, what specific trailer did we want? Further research narrowed our search down to three trailer models to choose from, all built by Northwood Manufacturing in La Grande, Oregon. Northwood trailers are heavy duty “four season” and “off-road” capable units built on heavy-duty, steel I-beam frames mounted over dual axles. The super structure is made of welded aluminum studs covered by a heavy-duty rubberized roof and plenty of windows to bring in natural light. They have high road clearance and they’re well insulated with double-pane windows and heated water tanks. Inside, they’re finished with high-quality hardwood cabinets, stainless steel sinks and appliances, walk-around queen size beds, leather upholstered dining and seating areas, and entertainment centers with HD televisions, surround sound and DVD systems. All of them come with roof-mounted air conditioners and dual-fuel water heaters, furnaces and refrigerators (electricity or propane). As a bonus, the re-sell value of them is very high. But, they’re also heavy weighing 10,000 to 14,000 pounds when fully loaded with water, cooking gear, equipment and personal belongings and, they’re expensive. The smallest Northwood fifth wheel model costs about $35,000 new while their travel trailers are a bit less expensive. Now that we knew approximately which trailer we wanted we could focus on the truck we’d need to tow it; and it would have to be a powerful one. After weeks of studying the towing guides for pickup trucks and talking to veteran RVers we decided on a pickup truck rated for a one-ton payload capacity (the weight carried in the bed of the truck). We wanted four-wheel drive and a diesel engine which provides much more torque for towing. We didn’t want a truck that was rated just barely strong enough to haul the weight of the trailer. 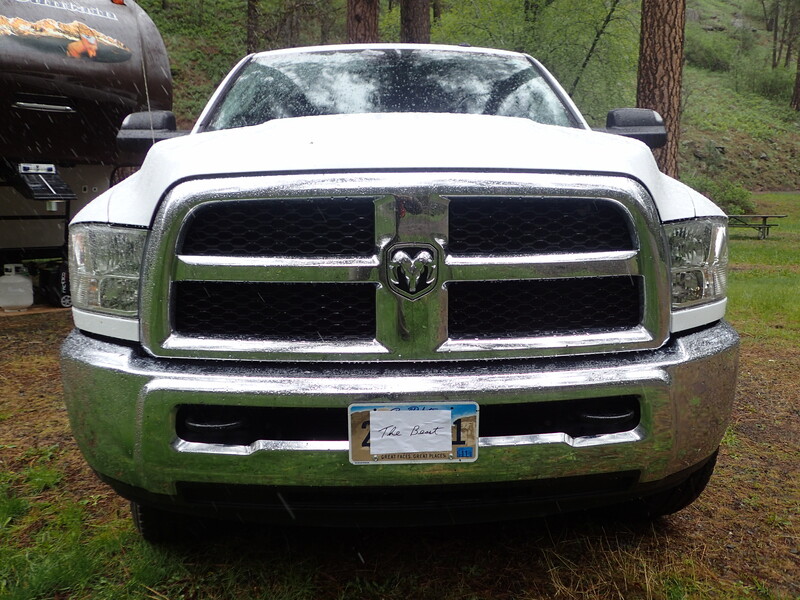 We wanted a truck rated well above those limits knowing that we would be towing up steep mountains and down rough back roads which adds additional stress on the tow vehicle. And, we wanted a four-door cab for taking friends with us and for extra space in the truck. Any of the one-ton models produced by the three big truck manufacturers would do; Ford, Chevy or Ram. We had narrowed our choice for the trailer down to the three Northwood models, but we’d need to have the truck first since we had no other means of transportation and we would start living in the trailer as soon as we bought it. If we ended up buying the heaviest fifth wheel trailer we were considering, the truck would be strong enough to pull it. On the other hand, if we decided on the much lighter travel trailer, the one-ton truck would be overkill. However, if we decided to upgrade into a larger trailer later on we would already have the vehicle to pull it. No matter which trailer we bought, with the one-ton truck we wouldn’t have to worry if we were pushing safety weight limits and, as veteran RVers say, you can never have too much truck. The cost between a one-ton truck and a three-quarter ton truck isn’t very much. But, just having a diesel motor in it adds $9,000 over the cost of the same model with a gasoline engine. Crew cabs and four-wheel drive add to the cost as well and a new one-ton diesel pickup truck, equipped as we wanted it, starts at about $50,000 or more. That was a budget-buster for us and we knew we would have to buy a used vehicle. Fortunately, there are a lot of used one-ton trucks available in the western U.S. and after three days of combing truck dealerships in the Seattle area we decided on a 2016 Ram 3500 diesel, crew cab, four-wheel drive pickup truck with 9,600 miles on it and selling at low Blue Book value. And it was still covered by the manufacturer’s warranty. We bought it from a car dealership in Everett, Washington. It’s a monstrous machine, twenty-one feet long and with such high road clearance that we had to have running boards installed to help us climb up into it. It takes a Walmart parking lot to turn it around and drinks diesel fuel like a drunkard getting fourteen to eighteen miles per gallon unloaded; about eleven mpg when hauling a trailer. But it’s comfortable and capable of towing just about anything we can hitch it up to. We call it The Beast. Now that we had The Beast we focused on the trailer. We had walked through various Northwood models at RV dealerships in Washington State, New Mexico and Oregon and researched them online. This led us to three Northwood models to choose from; two fifth wheels and a travel trailer. Northwood’s Fox Mountain 235 RLS at just under 28-feet long is the smallest fifth wheel Northwood makes. The next step up is Northwood’s Arctic Fox 27-5L fifth wheel, two feet longer than the Fox Mountain, but heavier and taller. We were also attracted to their 24 J, Arctic Fox travel trailer, at about 28 feet long and the lightest of the three by far. All three are built on Northwood’s “off-road” steel frames and equipped with the amenities we were looking for. Comparing the specifications between each model, such as axle weight limits, fresh and waste water capacity, storage capacity, and other technical factors only took us so far. All three Northwood models met the minimum technical specifications for us and other considerations soon emerged as more important. For example, fifth wheel trailers have much more storage space than travel trailers, but since the hitch of the fifth wheel is mounted in the bed of the truck there is less space to carry cargo there. On the other hand, since a travel trailer attaches to a hitch under the rear bumper, it leaves the bed of the truck completely open so extra cargo can be carried there which helps to offset their limited storage capacity. But, this adds the additional costs for buying a canopy to protect the things stored in the bed of the truck. 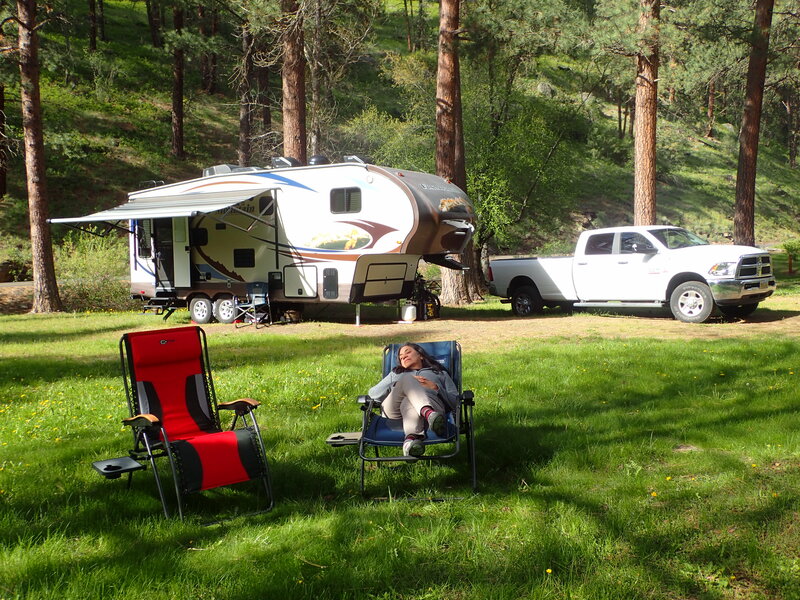 Travel trailers are lighter than fifth wheels, so you can tow them with a lighter-duty truck. But, fifth wheels have higher ceilings inside making them seem roomier. On the other hand, the lower profile of a travel trailer allows them to be towed into places where the higher profile of a fifth wheel may encounter low-hanging branches or rock outcrops that could damage roof-mounted equipment like air conditioners and antennae. Since fifth wheels mount into the bed of the pickup truck instead of to the rear of the vehicle, the overall length of truck and trailer hitched together is about five-feet shorter than the same size travel trailer would be. But, due to being hitched into the bed of the truck, fifth wheels can be maneuvered into tighter places than a travel trailer. Finally, we realized the most important factor was the floorplan. After all, we’d be living in the trailer full-time, so we needed an adequate kitchen, bedroom, bathroom, lounging area and, most importantly, a walk-around queen sized bed. Some RVs have a bed mounted sideways in the trailer to save space but this arrangement forces one person to crawl over the other to get out of bed and makes it much more difficult to make up the bed in the morning. All three of the trailers we were considering had good floorplans with walk-around queen size beds. They all had one “slide out” that extend the living area dramatically (slide outs extend outward from the body of the RV, but add about 500 pounds to the weight of it). The larger Arctic Fox 27-5L fifth wheel and the travel trailer both had separate bathrooms and spacious kitchens while the smaller Fox Mountain 235 RLS fifth wheel had a smaller kitchen area and the shower and wash basin were incorporated into the bedroom area with a separate, small water closet for the toilet. We were leaning towards the 24 J travel trailer when we arrived at Thunder RV in La Grande, Oregon, a RV dealership just a mile away from the Northwood factory. The owner said he had a used Fox Mountain 235 RLS available that they hadn’t even moved onto the lot yet and that he would sell to us for $11,000 less than a new one. What a find! 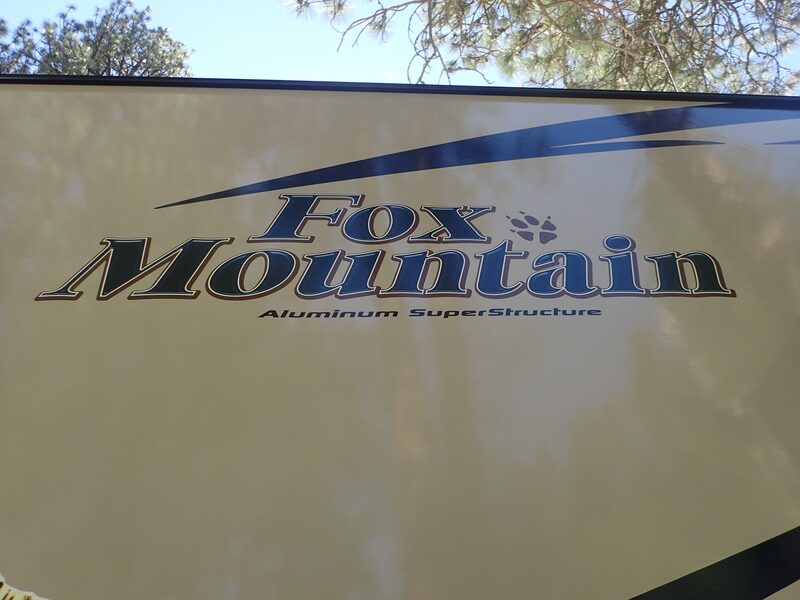 I had found only one other used Fox Mountain fifth wheel for sale in the entire United States; a 2008 model in California advertised at nearly the same price as this 2014 model. When we looked at the 2014 model at Thunder RV I found it had some important upgrades installed in it too; a solar battery charging system, a “topper” (a membrane that covers the top of the slide out to keep debris from jamming up the mechanism), and an upgraded ventilation and entertainment system. We weren’t crazy about the bathroom design, but the rest of the trailer was perfect. It was only 28-feet long and in like-new condition. We bought it the next day. Since then we’ve found it to be a solid home for us and easy to tow. We’ve made our own minor modifications in it and though it’s small, we almost immediately adjusted to living in it. We call it The Fox. So, now we lived in a RV. But, setting it up for living is another project and there’s a long list of essential equipment we needed. A lot of things like bedding, kitchen utensils and such are just standard things you have at home (although we had to buy all this stuff new since we didn’t have a home). But there is other equipment needed unique to living full-time in a RV. When buying equipment we insisted on propane or electrically powered devices (either AC or DC). We didn’t want to keep up with stocking three or four different types of fuels in addition to diesel for The Beast and propane for The Fox. So, we avoided buying equipment that was powered by gasoline, butane, batteries or other fuels. And, all the equipment had to be compact so we could stow it away in the cargo holds underneath The Fox or in a security tool box that I mounted in The Beast. Just about anyone that spends more than a weekend in a RV will need a portable generator to recharge batteries and power up the RV when not connected to a fixed power source. This is even more important if you plan to spend lots of time “way out there” as we did. Even our solar system only charges the batteries for a day or two and when the sun isn’t shining the batteries run down. So, we needed a generator. Not just any generator will do. 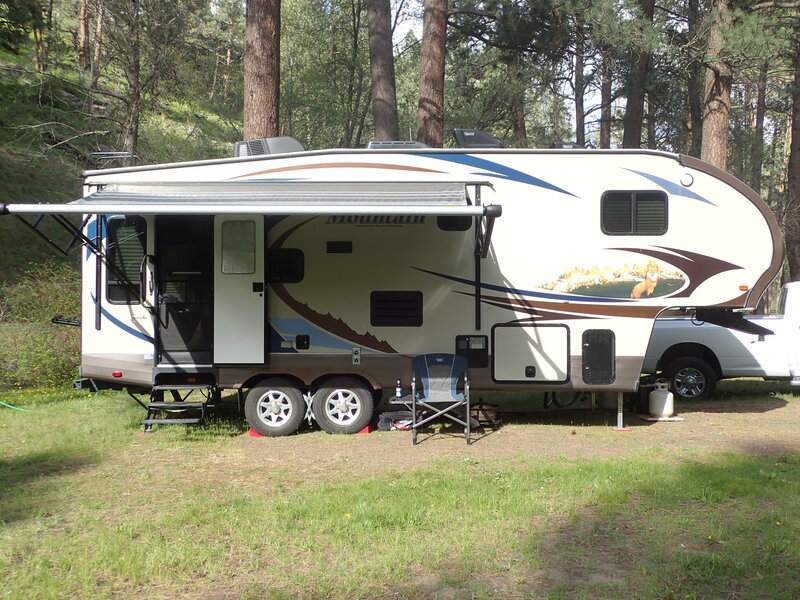 RV generators need to be compact and run quietly since you may be using them near other campers and a noisy generator can ruin the peacefulness of the places we planned to visit. Noise levels between 50 and 60 decibels are considered “quiet” and there’s a whole family of RV generators available that run in this range, but they aren’t cheap. Some equipment takes a lot of power to run like air conditioning units, microwave ovens, or water heaters and you’ll need a generator capable of producing 3,000 to 3,500 watts of power or more to run those things. But simply running lights or re-charging a cell phone can be done with a much smaller generator producing 1,000 to 1,500 watts. Many of these smaller generators can be tethered to a second one of the same type to double the output of just one, but that doubles the cost too. Serious RVers use small Honda or Yamaha generators built specifically for RV use, but they cost $1,000 each, produce about 1,200 watts of power, and run on gasoline. Doubling the power of these means buying a second one, so it’s a $2,000 investment. Onan makes a propane powered generator for RVs, but they cost $2,500 or more. There had to be something else out there, and we found it. We found a “dual fuel” Champion generator that runs on either propane or gasoline, operates at 58 decibels (slightly louder than one of the small Hondas or Yamahas), produces 3,060 watts on propane (3,600 on gasoline), and is compact and light enough to store in the cargo space underneath The Fox. I built a plywood ramp to help load and unload it from the cargo hold which doubles as a solid, flat surface to run the generator on. When we tested it on The Fox we turned on everything in the trailer including the air conditioner, microwave, lights and furnace and it ran it all simultaneously on just propane. So, we never have to use gasoline and we’ve found it runs for about 25-hours on a five-gallon bottle of propane. It cost less than $1,000 at a ranch and home supply company in Kennewick, Washington. Our whole lifestyle in The Fox is outdoor oriented and even though The Fox is equipped with a three-burner stove and oven, we didn’t want to cook messy, smelly things inside the small trailer. But, we like to eat well, so we knew that we’d need to have an efficient kitchen that we could easily set up outside and stow away in the cargo space underneath The Fox. There are fancy (and expensive) camp stoves and folding cabinets for outdoor cooking, but we found a much more economical and better solution. We bought a sturdy four-foot long folding table and a smaller three-foot one from Target, both for under $75. Then we bought a sturdy, two burner, 50,000 BTU propane camp stove from Sportsman’s Warehouse for $100. We bought a heavy duty, lockable outfitters ice chest to store outdoor cooking foods (and beer of course) for $300 at Walmart. We put together an outdoor cooking kit of utensils and some cleaning supplies that we could store in a small plastic storage bin which also doubles as a wash basin for washing dishes and, viola! 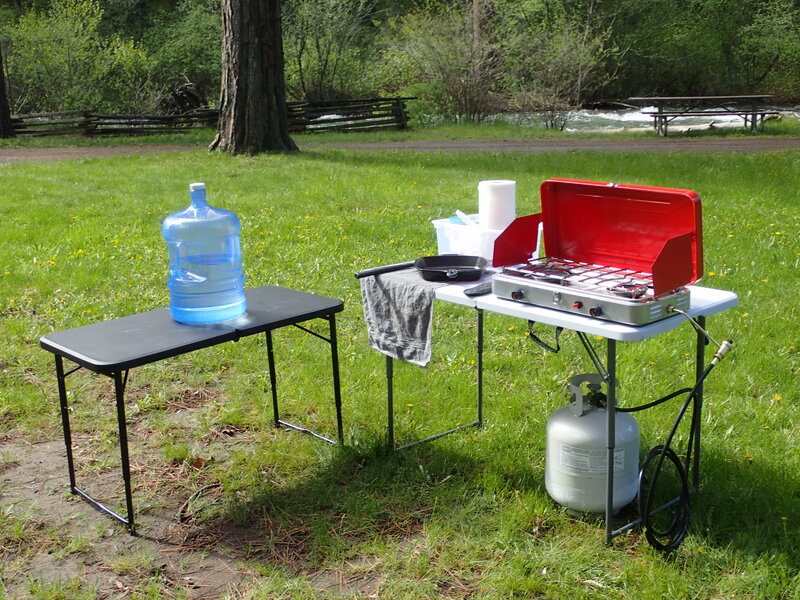 We had a simple, easily stowable, and efficient outdoor kitchen for under $500. The Fox is equipped with three holding tanks; one for fresh water (provides utility water to the faucets and shower), one for “grey water” (drainage from the shower and sinks), and one for “black water” (drainage from the toilet). 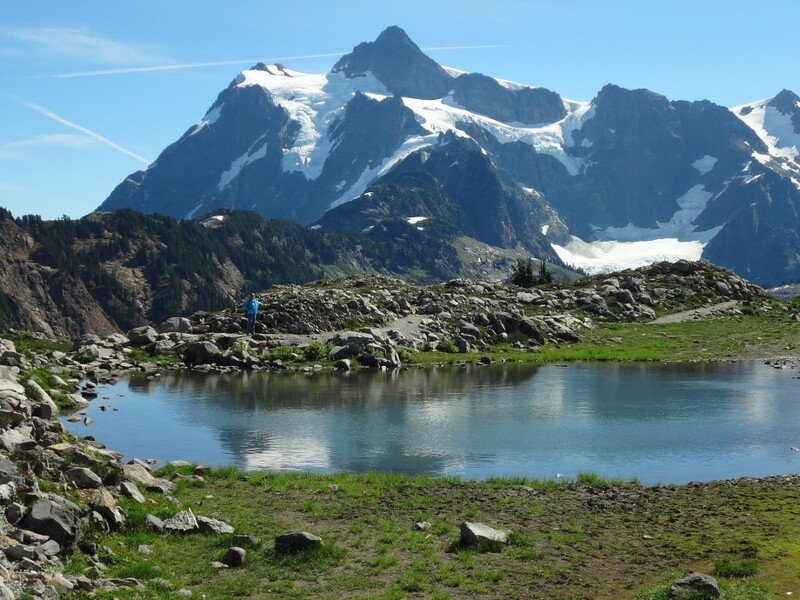 We use separate 5-gallon jugs of filtered water for drinking and cooking which we can fill at water dispensers in most major grocery stores, or filter our own from campground faucets or even a mountain stream. We have three five-gallon jugs of drinking water bungeed down in the bed of The Beast. 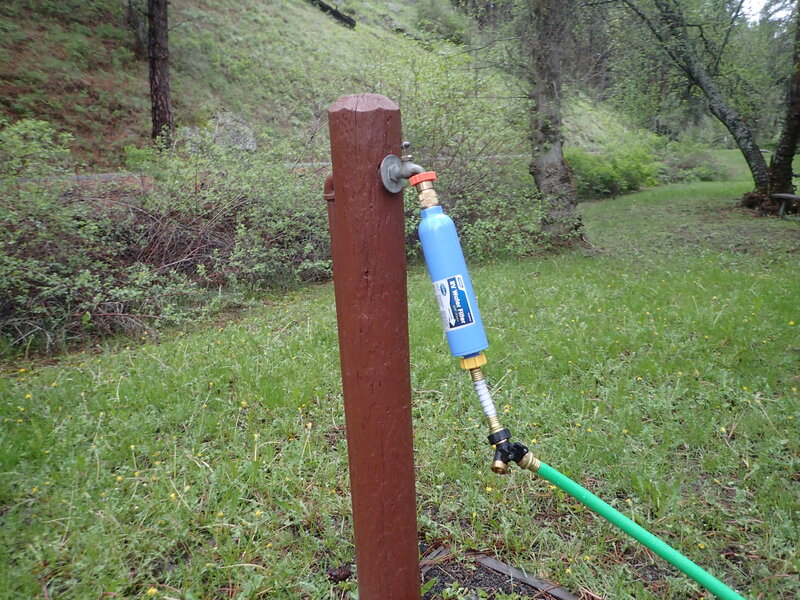 When staying in campgrounds or RV parks with water connections we attach The Fox to the water supply with garden hoses that are fitted with a water pressure controller since high water pressure can damage the tanks in The Fox. Immediately after the pressure controller we attach an in-line water filter canister, primarily to remove sediments which can also damage RV water tanks, but to remove any odors, bacteria or chemicals as well. The fresh water tank can be filled from any safe water source, even from jugs of water poured into the fill spout on the side of the trailer, so it isn’t too difficult to deal with. It’s the waste water tanks that limit how long we can camp without being connected to sewer utilities like in a RV park. And, of the two waste tanks, we’ve found that the grey water tank tends to fill up the fastest. Under normal use (quick showers, washing dishes, cooking) we can last about a week before the grey water tank is full. When the waste storage tanks are full, you have to go to a dump station somewhere to empty them. So, to conserve our liquid waste storage capacity we use the bathrooms in the RV parks or state parks when we stay there. In the outback we take quick showers (lather up, then rinse) and The Fox has an outdoor shower attachment, so showering outside doesn’t fill the grey water tank. I do as much of my toilet “business” outside as I can so that just one of us is using the inside toilet. All this extends our time for staying in remote areas up to two weeks or more. Fuel: The primary fuels needed in The Fox are propane and electricity. The trailer comes equipped with two, 7-gallon propane tanks which run the stove and, when an electrical power source isn’t available, the refrigerator, water heater and furnace as well. In addition, we carry two 5-gallon propane bottles to fuel the generator, outdoor kitchen and fire pit (we have a small propane-fueled fire pit – very nice to sit around on cold, starry nights). The Fox is designed to plug into 120 volt, 30 amp electrical service and the air conditioner, television and microwave oven work only on electricity. The generator supplies electrical power at 120 v and 30 amps, so we can power up everything with it, but when plugging into stationary power sources at RV parks or state campgrounds you can never be certain how well the electrical service has been installed, and we’ve seen some pretty sketchy installations. So, if we have any doubts about the electrical service, we plug an in-line surge protector directly into the service drop and then plug the power cord from the trailer into the surge protector. The surge protector tests the electrical source and shuts off power to The Fox if there are any problems. We also carry a five-gallon jug of diesel fuel secured by bungees in the bed of The Beast. Combined, this is enough fuel and electrical power to last us a couple weeks before we have to re-supply. Stability: RVs are equipped with extendable legs and jacks to firmly place the trailer in place and detach the truck from it. But, when we move into a camp it’s rarely level and we’ve found that if the trailer is just a few degrees off level it’s uncomfortable, plus the refrigerator needs to be level to operate properly. Another factor for stabilizing the trailer is soft ground. We sometimes need to distribute the weight of the heavy trailer to keep it from slowly sinking into soft ground. So, when we set up The Fox we use wood planks, blocks and plastic wedges to level it, distribute the weight, and to stabilize it in place. I also tie the tandem wheels to each other with expandable wheel locks which reduces the movement of the trailer when walking around in it. Setting up soon becomes a routine half-hour affair and these things are stored strapped down in the bed of The Beast. Security: We leave The Fox unattended for long periods of time when we go hiking or drive to town, so we want it secure when we aren’t around. All the outside cargo doors have locks, but the front cargo doors are Dutch doors, with an unlocked upper door that closes onto the locked lower door. We store some important things there so I installed an extra hasp-lock which then locks the upper door to the lower door. We also routinely use a “pin lock”; a steel tube that locks over the towing pin of The Fox to prevent anyone with a fifth wheel hitch from simply hauling it away. Bikes, generators and other equipment left outside are locked to the frame of The Fox with cable locks or chains. All of this only discourages crimes of opportunity and anyone with determination and a cutting torch, bolt cutters or power grinder could take anything they wanted. Without going overboard, you can only go so far with security. Insurance: We discuss health and vehicle insurance in some detail in our post, The Hard Start, so I’ll just quickly review that here. For health insurance; I’m on Medicare and Sonia has a private traveler’s insurance plan through World Nomads. These plans provide coverage nationwide, but are just major medical plans that cover hospitalization and accidents. For routine doctor’s visits and dental work we have access to Mexican health providers and try to save that work for our annual visits to Mexico. If something comes up that just can’t wait, we pay as we go. Insuring vehicles without a permanent address is trickier since many insurers won’t sell policies without a fixed, “legal” address. Fortunately, there are a number of RV-specific insurers that will, and we have comprehensive coverage for The Beast and full-replacement insurance for The Fox at very affordable rates. See our post, The Hard Start for more information on this. Tools: I carry a basic selection of tools; socket sets, screwdrivers, wrenches, pliers, vise grips, a power grinder/cutter and a cordless drill. We also carry a cross-bar lug wrench to avoid using the miserable, knuckle-busting lug wrenches provided with the trailer and truck. These things are stored in a lockable tool box that I mounted by bolts into the bed of The Beast. We also carry a shovel, axe and a few outdoor tools which stow away in the front cargo hold of The Fox. Toys: We like to play and so we carry some toys; a pair of mountain bikes, backpacking gear and an inflatable sea kayak. I retrieved my backpacking gear from our storage and it easily stores in an outside storage cabinet in The Fox. But, we needed to buy the mountain bikes and a sea kayak and these things are much more bulky. We bought a pair of used mountain bikes in Like-new condition from Craigslist for under $200 which lock onto a bike rack mounted to the rear of The Fox. The sea kayak was another story. I would have preferred a solid body sea kayak, but they’re 13 to 17-feet long and we would’ve had to install roof racks on The Beast to haul it. So, we opted for an inflatable one instead. Many of these inflatables are cheap, vinyl affairs that I wouldn’t trust. But, I found a used Advanced Elements tandem kayak, 17 feet long when inflated, on Craigslist for $500. This is a sea-worthy boat made of tough, durable material and It came with carbon-fiber paddles, pumps, spray skirts, aluminum keel and transport dolly. Even deflated the kayak is bulky and heavy, so it lives in the belly storage of The Fox while the paddles, pumps and other kayak gear stow away in the lockable storage box in The Beast. Communications: One of the biggest issues RVers face is staying connected, communicating by phone or internet, while on the move, especially in remote areas. The obvious choice would be a satellite system which can connect you from anywhere, but they are focused on accessing entertainment sites, cost $5,000 or more for the initial equipment setup, and about $200/month for the service. Unless you want to watch a lot of movies they aren’t worth it. That leaves cellular service and WiFi. Cellular signals are spotty, each provider has different areas of coverage, and public WiFi is only available in populated areas. You can use smart phones or personal routers as WiFi hotspots based on cellular signals and that’s what most RVers do. But you need a decent cellular signal for that, and when you’re far out in the outback there’s little or no signal. Also, each cellular service provider has different coverage for different parts of the country. We’ve found that for the western United States Verizon has by far the best coverage. AT&T comes in second. The smaller companies like T-Mobile, US Cellular, Sprint or prepaid plans just don’t have the coverage that travelers need. Some RVers sign-up for two services to ensure better coverage, but at an average of $110/month for unlimited talk, text and data plans the costs add up quickly. If you buy your phone or other equipment from your service provider, they will automatically sign you up for a two-year contract, something they tend not to tell you. Also, if you buy your phone from your service provider, it will only work on their network. This is because the phones sold by AT&T and Verizon are built with internal antennae that only work with their networks. So, even if you put another service provider’s chip in it, it still won’t work; another thing they fail to tell you when you sign up for their plans. You can avoid this whole debacle by buying your own phone separately (Amazon.com for example) and then sign up for cellular service using your own personal phone. That way you can use the same phone on any network and have only a month-to-month billing cycle. Not knowing all this, we bought an expensive Samsung Galaxy smart phone from AT&T and started with an unlimited talk, text and data plan from them. We’ll probably switch over to Verizon soon, or just keep both services, but we’ll have to figure out what to do with the expensive cellphone that only works on AT&T’s network. The term “unlimited data” is misleading. Unlimited means you get high speed data until you hit data-usage caps within the plan, usually 5, 10 or 20 gigabytes. Once you exceed your monthly data cap, the speed slows down considerably. You still have unlimited data, but at much slower speeds. Regardless of the service provider; If there’s no cellular signal where you are, then you can’t connect and it’s time to break out the lounge chair and beer. But, if you can get even a weak signal there is mobile signal boosting equipment available that captures weak signals and transforms them into a usable form (signal boosting is not to be confused with signal amplifiers which increase a signal inside of a house). Signal boosters use a small, portable antennae that captures the signal and send it via cable to a personal router inside the RV. The router then amplifies and distributes the signal within the RV to operate your computer, cell phone, tablets and if you have enough data, stream in movies, skype. 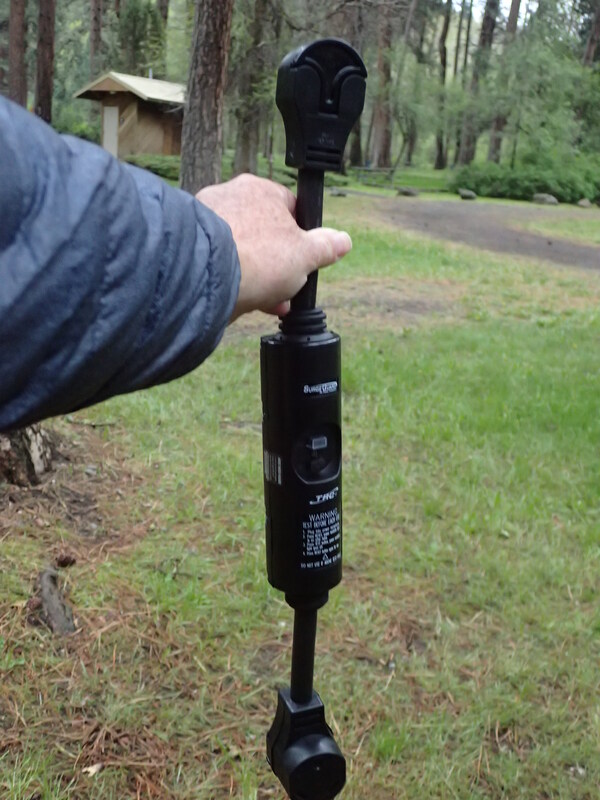 This equipment is available from vendors like Amazon.com for about $300 and can be used in your vehicle as well as the RV. But, once again, BUYER BEWARE. As with cellphones, if you buy any of this equipment from your service provider you will be signed up for a two-year contract. But, if you buy your own signal boosting and routing equipment you can get month-to-month service plans without entering into contracts. OK, that’s it. All this equipment, services and gear sounds like a ton of “stuff” and expensive too. But, after stowing all of this gear away we still have lots of cabinet space inside of The Fox and we’re living the RV lifestyle at about the same cost that we were traveling around with backpacks or living in our house before we started this adventure. We’ll probably pick up more gear along the way, or maybe get rid of some. But for now we’re comfortable, happy and secure in our small mobile home and looking forward to exploring western North America from the comfort of The Beast and The Fox. Keep checking in here at imaginetraveldiscover.com as we report from the outback of North America and who knows; maybe we’ll see you along the way.